By Sam Smith | 1.3.2015 | 5:20 p.m.
Jimmy Butler produced one of the great offensive performances in Bulls franchise history with a record 40 of his 42 points in the second half to rally the Bulls to a 115-113 victory over the Toronto Raptors. “We went back in the locker room (t halftime) and I told my guys I’m going to come out being aggressive,” Butler told WGN-TV after the game. 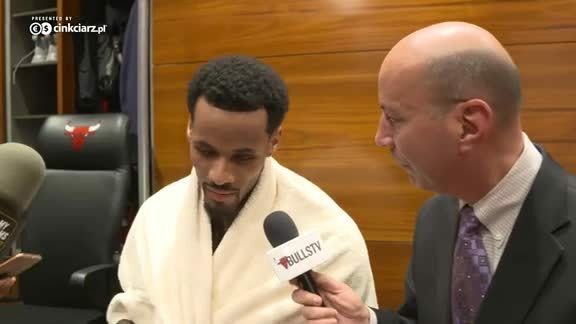 The Bulls rallied from a 12-point halftime deficit and 15 midway through the third quarter behind the extraordinary play of Butler, who had just two first half points and had to get stitches after being elbowed in the face late in the second quarter. 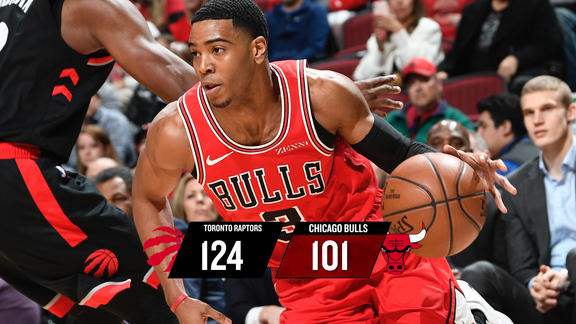 Butler returned with a vengeance to start the second half, taking the ball hard to the basket for 21 third quarter points to get the Bulls within six. Butler then had 19 more points in the fourth quarter and a pull up three pointer with 40.8 seconds left to finally give the Bulls a lead at 112-111. The Bulls closed it out with free throws and defensive plays and recognizing the accomplishment, Bulls players surrounded Butler in a group hug as the game ended. The Bulls went to 20-12 with their second win over 21-14 Toronto in a week. Pau Gasol had 19 points, 13 rebounds and six assists and Nikola Mirotic had 17 points. Three Toronto players led by DeMar DeRozan with 24 points scored more than 20 points. The Bulls were without Derrick Rose for a third straight game, though Rose was with the team in Toronto. The team scheduled an MRI exam for Rose Monday with Rose saying he had some knee soreness. But Rose told reporters before the game he felt good, had just pushed himself too much on off days and was confident he’d be playing soon, perhaps even Tuesday against Milwaukee. The Bulls then hit Toronto with yet another blizzard in a 17-10 start with Kirk Hinrich making a pair of three pointers and Nikola Mirotic another. But the Raptors saw the Bulls 10-0 run and called it with one of their own to take the lead before the Bulls tied it at 26 after one quarter. The Bulls got a double dose of backcourt trouble in the second quarter when Butler took an elbow and had to leave for stitches. Butler had just returned after the Raptors took a 40-33 lead attacking the Bulls backup guards. Then Toronto closed aggressively to lead 60-48 at halftime, shooting 59 percent in the second quarter to 32 percent for the Bulls. A familiar Bulls issue appeared as Toronto had a dozen second chance points by halftime and 10 points on turnovers while the Bulls had zero fast break points in the half. The third quarter was the Butler show as Butler became aggressive in his return from being stitched up and began to cut open the Raptors in every way possible. Butler scored a career quarter best 21 points in the third on an assortment of physical, steamroller drives and pull up jumpers to rally the Bulls within 87-81 going into the fourth quarter. Butler was seven of nine from the field and seven of seven on free throws in the quarters.